This store was founded by William Henry Belk in North Carolina in 1888. With continued success, Belk is now a chain of over 300 stores across America. They offer quality apparel, shoes, accessories, cosmetics, home furnishings that are sure to please. Now you can purchase a discounted Belk gift card and save money on your entire purchase! Grab yours today and see for yourself why this store has, for years, had so many fans! Don’t forget gift cards make great presents too! Finally, you can find everything for your family and home at prices you can afford. 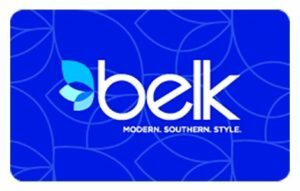 Not only will a Belk gift card save you money on your entire purchase, but you can also use any coupons you may have. If you’ve dreamed of updating your wardrobe or your home furnishings, then this is a perfect time! Just imagine what you’ll do with all the money you save. You’ll find everything you’re looking for and more! From quality, stylish clothing for the entire family, to candles and silverware, they have you covered! And for less money too! With Cards2Cash, looking great is a snap! A discounted Belk gift card will get you more great home furnishings and family apparel for less money! And believe me, you’ll find something for everyone. They have departments in women, men, juniors, baby & kids, beauty, shoes, handbags & accessories, jewelry & watches, bed & bath, and for the home! They even have stylish luggage sets for the jet-setters among us! When you buy your Belk gift card from Cards2Cash, you’ll get the best value for your money. Cards2Cash offers gift cards for a variety of stores, so make sure you check out our listings for Macy’s, Dillard’s, and Nordstrom. At Cards2Cash, we work to save you money on all the stores and restaurants you love. Do you have a Belk gift card you aren’t going to use? We will turn that unwanted card into money! Cards2Cash pays the highest price possible for gift cards. If interested, visit one of our retail locations, and we’ll pay you on the spot, OR you may fill out our easy online form, and we’ll get back to you quickly with an offer for your card. Whether you want to buy a gift card or sell one, Cards2Cash is the only place you need to go!